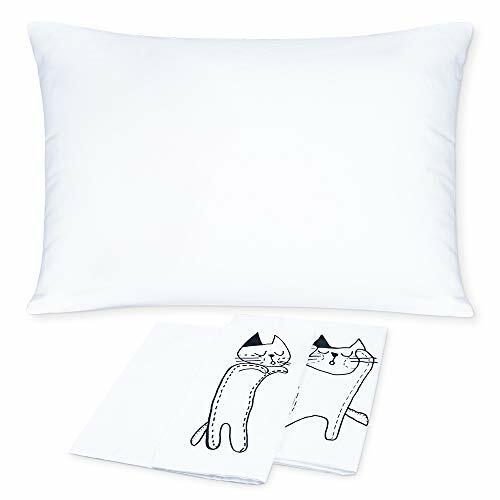 BABY TODDLER PILLOW SET: 2pcs washable cat Print Pillowcases+1pcs toddler pillow ,these simple and ultra soft pillowcases can cover and protect pillows from being dirty and also can decorate babies\' bedroom. It is a bed product which you can use in all seasons. PRODUCT FEATURES: Our baby pillow made of a 100% Soft Organic Cotton Cover and a Microfiber Filling,which is Breathable, hypoallergenic, Soft Fibers Filling are the best options to resist mold, mildew and mites, Regularly changing your pillow case will help protect the product and your child. PERFECT SIZE FOR TODDLERS :13 inches x 18 inches ，Not too small, not too large, perfect for your child. Pillows Contains a dense soft fiber so we can use less filling than most toddler pillows to give the Best Back and Neck Support For Any Child. WORKS AS A TRAVEL PILLOW :Perfect for toddlers Sleeping in a Car or Airplane,Adults & Children Both Love this Pillow! Pillows for kids give them security, familiarity and make them feel like they\'re growing up!Not recommended for a baby under 3 years old. MANUFACTURER GUARANTEE:If You\'re Unsatisfied with Our Toddler Pillow,Please contact us ,we will help you solve the problems in 12 hours.